202 pages | 23 B/W Illus. Effective performance management systems are essential in any successful organisation. In both commercial sport business and not-for-profit sport organisations, the pressure to follow international best practice in performance management has grown significantly in recent years. Organisational Performance Management in Sport is the first book to show how performance management concepts, tools and principles can be applied in the modern sport environment. Linking theory and practice throughout, the book defines fundamental performance parameters impacting on sport organisations, and introduces key issues such as individual performance management through to board-level governance structures, presenting extended real-world case studies and practitioner perspectives. As such, it offers the most clear and complete outline of performance management in sport organisations available. 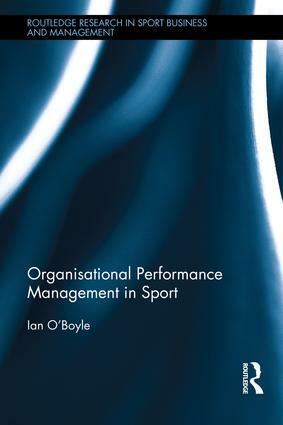 With case studies, insight boxes and industry examples integrated throughout the text, Organisational Performance Management in Sport offers accessible and vital reading for all sport management students, researchers and professionals with an interest in this important area of sport management research and practice. Ian O’Boyle is a lecturer in sport and recreation management in the UniSA Business School, Australia. He is also a member of the Centre for Tourism and Leisure Management (CTLM) based within the School of Management. Dr O'Boyle is a leading researcher in the area of organisational performance management, sport governance, leadership and other associated disciplines within the field of sport management. He has previously been affiliated with Ulster University in the UK and Massey University in New Zealand. Through his strong links with industry he has most recently been involved in a number of research projects analysing issues such as performance management and governance at the National Sport Organisation level and has been successful in obtaining numerous research grants to carry out this work. His work appears in the leading sport management journals including Journal of Sport Management, European Sport Management Quarterly, International Journal of Sport Management and Sport Management Review, and also within traditional business and management-based journals such as Journal of Career Development and Organization Development Journal.